In The Division 2 crafting plays an important part of the game as it allows you to fine-tune your gear for maximum effect. The first big upgrade that you will be able to unlock at the White House is Crafting and it is earned by completing the Grand Washington Hotel story mission for the Theater settlement. Once his mission has been completed and you return to the White House you will be able to recruit Inaya al'Khaliq, the crafting manager. To find her, look on the ground floor of the White house to the left and left again after you pass Quartermaster Coop Dennison. 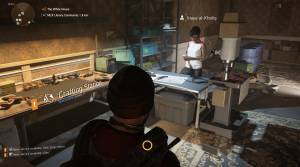 Our Division 2 crafting guide tells you everything you need to know. · What do you need to Craft? · Where do you find Crafting Materials? Although learning how to craft in The Division 2 can net you some great gear as you play it is not until you reach the endgame where it becomes really important. This is because it is the only way to keep progressing your character once you reach the 30 level cap. It is advised that you don't immerse yourself in crafting until you get to Level 30 mainly because while you are still leveling up anything you do craft will quickly be overtaken as you progress. Also, the crafting resources that you use can be put to much better use with things like helping settlements to gain XP and speed up leveling. You will find each of the above essentials for crafting in a different way as you play, it tends to either get dropped by enemies when you kill them or by completing missions. Where do you find Crafting Materials? Deconstructs to give you receiver components. Deconstructs to give you protective fabric. Deconstruct to give you printer filaments. When you deconstruct loot there is also the possibility of getting polycarbonate, ceramics, and steel. These are rare finds though, you will find far more of these materials in the world. The enemies from the different factions will drop a specific type of loot when you kill them (see below). Use this information to target a particular faction to increase you chances of getting a certain type of material. When you reach the later stages of the game you will begin to find new and rarer crafting materials. Drop polycarbonate generally, and also electronics from high level enemies. Drop steel, and carbon fiber from higher level enemies. Drop ceramics, and titanium from stronger members. Why not check out our guide on How to Level Up Fast.